They are hailing it as the “only filter your skin needs”, and when the amazing Avène is concerned, you know that means business! For those that may not have tried it (shame on you! ), Eau Thermale Avène is a legendary French skincare brand that creates of some of most gentle and calming products out there. 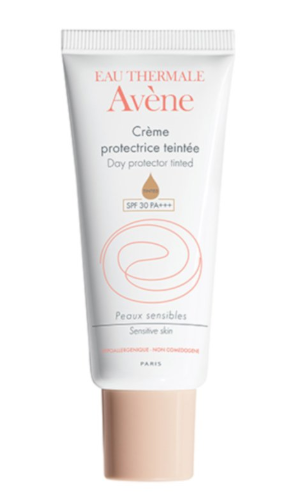 It is centred around the use of thermal spring water for its soothing properties, and all Avène products are created to heal and soothe even the most sensitive of skin types, including babies and kids. A pharmacy-only brand that often flies a little under the radar, it is one of the most recommended skincare brands by French dermatologists and works to fight against irritated skin, intolerant skin and allergic skin. Its most famous offering is its Thermal Spring Water, which has calmed my skin over the years even when it’s been at its most eczema-afflicted. A naturally soothing source for sensitive skin since 1743, Avène’s Thermal Spring Water's unique composition is clinically shown by over 150 studies to calm, soothe and soften the skin. Ideal for red, sensitive or irritated skin and perfect for post-workout, travel, outdoor activities or to freshen up makeup, it is incredibly reasonably priced and a must in every bathroom. But I digress… the newest beauty weapon this incredible brand has added to its arsenal comes in the form of an almost-makeup-but-better, BB formulation. Called Day Protector Tinted BB Cream SPF 30, it is subtly tinted to suit most skin complexions, hydrates sensitive skin, provides soothing relief and daily protection from external stresses. Sheer enough to let you natural glow shine through, the formula includes the iconic Avène Thermal Spring Water to soothe discomfort, a SPF 30 photoprotective system to protect the skin from the harmful effects of UVB and UVA radiation, and a combo of mineral pigments and brightening pearls to unify the complexion and instantly correct any colour flaws. All about your skin and nothing else, it is also blissfully free from parabens, alcohol and fragrance, so is fine even for hypersensitive skin like mine. The brand recommends that you prep your skin with their Hydrance Optimale Serum for an extra boost of hydration before application, then apply Day Protector to your entire face and neck and wait for it to be absorbed, giving you a breathable dewy finish plus that all-important UV protection. I’ve been using a little of my favourite RMS un-cover up on my super red areas (my rosacea is seriously horrible right now, but that’s another story!) and then leaving the good parts to show through, and have absolutely loved having this option to use on weekends and down days when I definitely don’t want – nor need – a face full of foundation. Highly recommended, this beauty is on counter now with an RRP of $49.99.